It is appropriate that the weather of last month of 2018 was rather similar to many earlier months in the year. Statewide, precipitation was above average for the 10th month of 2018 and the temperature was above average for the 8th month. This resulted in the year being the wettest on record and the 11th warmest since statewide observations began being calculated in 1895. More on this later in the report. December precipitation totaled 5.88”. This is 2.03” above the 1981–2010 average and ranks as the 15th wettest. Snowfall averaged 1.0”, which is 3.9” below average and the 31st least snowy December since 1895. The only notable snowfall was across a swath of south Jersey on the 5th, leading to a south Jersey monthly average of 1.7”. This is 1.9” below average and ranks as the 55th least snowy December. Northern counties averaged 0.6” for the month, some 6.0” below average and ranking 19th least snowy. Central counties came in without any measurable snowfall. This is 5.5” below average and joins ten other Decembers of the past 124 years without measurable snow, four of which have been this century (2001, 2006, 2011, and 2015). The average statewide temperature was 37.8°. This is 2.6° above the 1981–2010 average and ranks as the 17th mildest December of the past 124 years. On the 7th, the Rutgers NJ Weather Network (NJWxNet) welcomed a new station into the program at Sandyston in Sussex County. The Office of the NJ State Climatologist teamed up with Montclair State University’s School of Conservation to install this station, which sits at an elevation of 244 m within Stokes State Forest. It is one of only three NJWxNet stations with an acoustic snow measurement gauge, the others being Jersey City (Hudson County) and Pittstown (Hunterdon). Visit the search function on the display of five-minute observations from these stations to load the snow data onto the station spreadsheet. Maximum temperatures equaled or exceeded 55° at the 64 NJWxNet stations on 11 December days. Twice, there were three consecutive days reaching this mark, with the longest gap between 55° days being 9, from the 4th–12th. To start things off, Woodbine (Cape May) topped out at 65° on the 2nd, with Oswego Lake (Burlington) 64° and 31 WxNet stations from 60°–63°. It only got to 46° at Walpack (Sussex). On the 3rd, Berkeley Township (Ocean) and Oswego Lake reached 62°, with 15 stations between 60°–61°. The 13th saw Woodbine up to 55°, while High Point Monument (Sussex), High Point (Sussex), and Sandyston only made it to 29°. Vineland (Cumberland) hit 55° on the 14th, with Dennis (Cape May) to 57° and Woodbine 56° on the 15th. The 20th brought highs of 62° to Mannington (Salem), 61° to both Vineland and Upper Deerfield (Cumberland), and 60° at seven other stations. The 21st was the warmest day of the month, with Cherry Hill (Camden), Upper Deerfield, and West Deptford (Gloucester) soaring to 66°. Maximums were from 60°–65° at 45 WxNet stations, with the coolest high of 57° at West Cape May (Cape May). Every NJWxNet station topped out from 50°–57° on the 22nd, led by Cherry Hill and Stewartsville (Warren). The lowest minimums on the 22nd were a mild 40° at High Point Monument and High Point. More 60° warmth invaded NJ on the 28th, with Cherry Hill up to 62° and 26 stations from 60°–61°. High Point Monument only made it to 49°. The warmth carried over into the early hours of the 29th, with Cape May Court House (Cape May), Oceanport (Monmouth), and Sea Girt (Monmouth) at 58°. The month ended with 58° at Woodbine and Mullica (Atlantic) on the 31st, while eight stations were from 55°–57°. High Point Monument could only muster a high of 38°. One or more NJWxNet stations fell below 20° for a daily minimum on 13 December days. One of these days, the 20th, also saw the 60° mark reached at other NJWxNet stations. The first sub-20° minimums of the month occurred during the evening of the 4th, with the temperature falling to 18° at High Point Monument and 19° at Walpack. Minimums the next morning dipped to 13° at Walpack and 15° at Pequest (Warren). These two stations followed up with 13° and 14° lows, respectively, on the 7th. Walpack fell to 14° on the 7th, followed by Sandyston at 15°, the latter providing an early indication that this new station is destined (without surprise) to be one of the coldest in the NJWxNet. The 8th was the coldest day of the month, with Berkeley Township down to 9°, Sandyston at 10°, and 46 stations between 11°–19°. This was followed by 12° at Walpack and Sandyston on the 9th, and 11° in Walpack and 13° at Pequest and Sandyston on the 10th. The 11th came in as the month’s second coldest day, with Walpack down to 9°, Sandyston 10°, Pequest 11°, and 24 stations from 12°–19°. In the far south, Woodbine at 19° was the coldest in NJ on the 12th. Cold returned on the 18th, when High Point Monument dropped to 16° and Walpack and High Point fell to 17°. Walpack was 13° on the 19th, with five stations at 15°. Walpack bottomed out at 16° on the 20th and Sandyston 18°. Berkeley Township again took low honors on the 26th at 17°. There were four events in December where more than an inch of rain fell at multiple NJ locations. Or were there five? Well, it turns out that ten NJWxNet stations had between 1.00” and 1.33” during the calendar day of the 31st. However, official NWS Cooperative stations mostly observe daily at close to 7AM, as do CoCoRaHS observers. At these stations, the 31st ended at observation time, thus the afternoon and evening rainfall gets entered as the morning observation on January 1, 2019. Only at relatively few midnight observing stations, such as Newark (Essex) and Atlantic City (Atlantic) airports, does the rain from the second half of the 31st factor into December and 2019 totals. Thus while the bulk of the event occurred on the 31st, this storm will barely factor into the 2018 total. So, keeping this in mind and looking at CoCoRaHS data through the morning of the 31st, the wettest locations in NJ in December were Berkeley Township with 7.59”, followed by Stafford (Ocean) with 7.46” and 7.08”, Lacey Township (Ocean) 7.36”, Belmar (Monmouth) 7.29”, Brick (Ocean) 7.08”, and Toms River (Ocean) 7.06”. Far southern and west central areas saw the least December precipitation, including 4.11” in Middle Township (Cape May) and Flemington (Hunterdon), Hopewell Township (Mercer) 4.22”, Wildwood Crest (Cape May) 4.49”, and Burlington (Burlington) 4.63”. The first event from the afternoon of the 1st through the evening of the 2nd saw the most rainfall in Middlesex County, where three Woodbridge stations recorded 1.23”, 1.21”, and 1.18”, while New Brunswick and South River each caught 1.13”. The least fell in the southern half of Cape May County, where totals were mostly less than 0.30”. A rather unusual inverted trough situation on the 5th led to a burst of snow moving onshore close to Atlantic City (Atlantic) and generally traveling to the northwest up the Atlantic City Expressway corridor to Gloucester County (Figure 1). Two Brigantine (Atlantic) observers reported 7.5” and 7.3”, and 6.4” fell in Atlantic City. Top totals in other counties that received as much as an inch included Beesleys Point (Cape May) 5.0”, Vineland 4.8”, Newfield (Gloucester) 4.2”, Pittsgrove (Salem) 2.5”, and Winslow Township (Camden) 1.0”. The snow melted down to several tenths of an inch of liquid. Northern and Central Jersey missed out on this event. Figure 1. South Jersey snowfall totals on December 5th. Rain fell from the afternoon of the 14th before tapering off to drizzle on the morning of the 15th. Totals were moderate in Cape May County, with Wildwood Crest picking up 0.56”, Lower Township 0.51”, and Middle Township and North Wildwood each with 0.50”. After about a 12-hour break in precipitation, rain resumed late in the evening on the 15th and continued for about 24 hours. Freezing rain fell at higher elevations in the northwest and some sleet mixed in toward the end of the event in that region. Otherwise, it was a plain soaking rain that fell heaviest in the southern half of the state. Twenty one CoCoRaHS stations picked up between 2.00” and 2.98”, topped by Lacey Township with 2.98”. Elsewhere, two Stafford Township stations caught 2.77” and 2.55”, Berkeley Township 2.62”, and Hammonton (Atlantic) 2.54”. Some 164 of 204 CoCoRaHS reports were between 1.00”–1.99”, with Lawrence Township (Mercer) seeing the least with 0.68”. Light rain began falling during the afternoon of the 20th, increasing in intensity in the evening and overnight hours, before tapering off during the morning and midday hours of the 21st. The heaviest rain was in the north and along the middle and northern coast. Totals were as high as 2.94” in West Milford (Passaic), Jefferson Township (Morris) 2.82”, Ocean Township (Monmouth) 2.75”, Rockaway Township (Morris) 2.62”, and Belmar 2.61”. Some 63 stations received 2.00”–2.94”, 97 from 1.50”–1.99”, and 73 between 1.99”–1.49”. Lower Township saw the least, with 0.98”. Thunderstorms accompanied the rain during the overnight period in the Interstate 195 corridor, with pea- to dime-size hail reported in several locations. Strong winds toppled some trees in various parts of the state, with limited power outages. A clipper system put down a dusting to about an inch of snow over northern NJ early on the 24th. In Sussex County, Wantage saw 1.8”, Hopatcong 1.5”, and Montague 1.4”. Later in the day, some sleet mixed in with rain during some midday showers along the northern coast. Another soaker visited the entire state from the predawn hours of the 28th to early evening that day. Most of the state saw over and inch fall, with the exceptions being the far north and northwest and southern Cape May County (Figure 2). Heaviest amounts included 2.51” in Monroe Township (Gloucester), Toms River 2.21” and 2.13”, Upper Deerfield 2.16” and 2.10”, and Franklin Township (Gloucester) 2.12”. Some 164 stations caught between 1.00”–2.06”. Figure 2. Rainfall from approximately 7 AM on the 28th to 7 AM on the 29th. Observations are from CoCoRaHS stations. Reiterating that the totals from the storm that began on the afternoon of the 31st and lasted into the early hours of January 1, 2019, do not count in monthly totals at CoCoRaHS or most NWS stations, it is worth briefly mentioning. This event deposited a rather evenly-distributed 0.50” to nearly 1.50” across all areas except the far south, where less fell. Harrison (Hudson) led the way with 1.46”, followed by Bedminster (Somerset) 1.41”, and, in Union County, 1.36” at both Westfield and Springfield. The highest barometric pressure during December was on the 27th, when it ranged from 30.55”–30.65”. Lowest readings were on the 21st and 22nd, when the barometer dipped to a rather low 29.15”–29.25”. Winds gusted to 40 mph or higher at one or more NJWxNet station on eight days. High Point Monument received gusts as high as 53 mph on the 3rd and 45 mph on the 4th. Sea Girt gusted to 40 mph on the 15th and 42 mph on the 16th, when it was joined by Seaside Heights (Ocean) at 45 mph, and Fortescue (Cumberland) and Berkeley Township, each at 40 mph. Hawthorne (Passaic) reached 42 mph on the 18th, with Basking Ridge (Somerset), Sea Girt, and Seaside Heights all at 40 mph. Lower Alloways Creek Township (Salem) felt a 44 mph gust on the 20th. Thanks to the deep low pressure over the region, the 21st was December’s windiest day. Seaside Heights reached 45 mph, Sea Girt and Upper Deerfield 44 mph, six stations from 40 mph–43 mph, and 15 others peaked at 35 mph–39 mph. As winds slowly slackened on the 22nd, Mullica hit 44 mph, Pennsauken (Camden) 43 mph, Berkeley Township and Seaside Heights each 42 mph, and Harvey Cedars (Ocean) 40 mph. The majority of this annual review focuses on our 10th annual top 10 list. Before getting to that, a brief recap of 2018 temperature and precipitation is in order. The statewide annual temperature of 54.2° was 1.3° above the 1981–2010 average and 2.4° above the 1895–present average. This ranks as the 11th warmest year on record (Table 1). All of the top 10 years have been since 1990 and 15 of the top 20 warmest years over the 124-year period of record have occurred since 1998. Table 1. The 20 warmest years across New Jersey since 1895. Annual precipitation (rain and melted frozen precipitation) averaged 64.79". This is 18.43” above the 1981–2010 average and is the wettest calendar year on record (Table 2). Table 2. The 10 wettest years across New Jersey since 1895. The distribution of annual precipitation totals around New Jersey was remarkably uniform, with all counties on average receiving between 60” –70”. This is also reflected in the totals within the three climate divisions within the state. 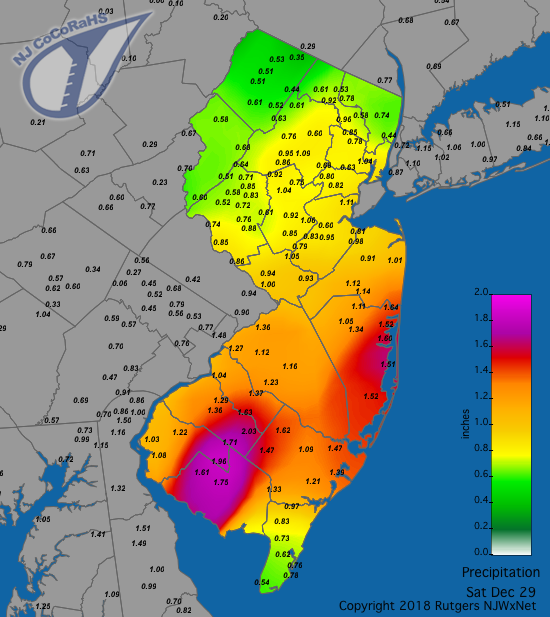 The southern division (Mercer-Middlesex-Monmouth counties southward, except for the small coastal division east of the Garden State Parkway) totaled 63.76”, easily beating out 2011’s 59.24” for the top spot. This is 18.71” above average. The coastal division, with 62.93”, had its wettest year too, 18.74” above average and well ahead of formerly number one 1958 with its 59.59”. The northern division (Hunterdon-Somerset-Union northward) came in with 65.33” for this year. This is 16.70” above average, but is only enough to rank as second wettest on record, behind the 72.49” total in 2011. This even distribution of precipitation is testimony to the scattered nature of the deluges that occurred at times during the summer, and more so a function of numerous statewide soakings. An excellent example of the latter is seen in most of the November events and several in December. Another interesting aspect to the annual soaking was the absence of a major tropical system contributing a huge amount of widespread rainfall, such as was the case with Irene in late August 2011. 2018 will be remembered for storm after storm after storm! Stations receiving the most precipitation in 2018 were generally ones that received one of the aforementioned localize deluges (see number 3 on the top 10 list below). Top annual totals included Belmar (Monmouth) with 80.90”, followed by Mine Hill Township (Morris) 79.89”, Rockaway Township (Morris) 79.28”, Lakewood (Ocean) 78.00”, Hardyston (Sussex) 77.77”, and Bethlehem (Hunterdon) 73.29”. While also well above average, the least amount of precipitation in 2018 was caught in Wildwood Crest (Cape May) with 58.99”, followed by Upper Deerfield (Cumberland) 59.24”, Winslow Township (Camden) 59.60”, Burlington (Burlington) 60.16”, and Franklin Township (Gloucester) 60.41”. For the tenth consecutive year, we in the state climate office have evaluated the myriad of daily, monthly, and annual observations gathered across New Jersey during the course of the year to choose what we feel were the most significant and impactful ten events (with one other knocking on the door). More about each event can be found in the monthly narratives posted on njclimate.org. You might be tempted to rearrange the rankings, particularly as some of the events on the list may have affected you more than others ranked higher. Or perhaps you best recall one that didn't make the list. That's the enjoyment and frustration of lists! Unless stated otherwise, statewide values are based on an average of several dozen stations. The period of record for monthly, seasonal, and annual departures is 1981–2010; while for extremes and rankings it is from 1895–present. Observations are mainly drawn from National Weather Service Cooperative Observing Program stations, Rutgers NJ Weather Network stations, and NJ Community Collaborative Rain, Hail and Snow Network locations. Annual: Statewide annual precipitation averaged 64.79”. This is 18.43” above average and 0.84” greater than the previous record wet year of 2011. NJ’s statewide annual precipitation averages 46.36”. Seasonal: fall (Sep.–Nov. ): wettest on record at 20.73” (+9.18”), surpassed previous record in 2006 by 2.73”. Monthly: 9 months above average; February 3rd wettest, September 8th wettest; November 2nd wettest. 11 days with one or more station receiving 4.00” or more. Just one-day totals, not necessarily an entire storm event. Oftentimes, this rain fell in just hours (Table 3). Flash flooding from events in/near all locations, most notably Lakewood, Cedar Grove, and Woodbridge events. Table 3. Top totals on days where more than 4.00” of rainfall was observed in NJ. All observations are from approximately 7AM to 7AM, with the report date the date on which the 24-hour report was measured. Information following most stations is the geographic distance (in miles) from the center of the community and the CoCoRaHS designation of the station. Annual: Statewide average temperature of 54.2° is 1.3° above average. Seasonal: 5th warmest summer (Jun.–Aug.). Monthly: 8 months above average; February 2nd warmest, May 4th warmest, August 1st warmest (tied with 2016), and September 3rd warmest. Statewide: 16.6” snowfall, 4th snowiest. Regional: 26.4” in the north (Sussex, Passaic, Bergen, Warren, Morris, Essex, and Hudson counties). Monthly station record: 44.3” Jefferson Township (Morris). Four snowstorms depositing as much as 16.5” in Branchville (Sussex) (2nd–3rd), 26.8” in Montville (Morris; 6th–7th), 7.5” at Highland Lakes (Sussex; 13th), and 15.0” in Lacey Township (Ocean; 20th–22nd). The statewide monthly average temperature of 39.5° in February 2018 exceeded the 2018 March average of 38.2°. It was the second mildest February, only exceeded by 2017. This was only the fourth time on record when March was colder than the previous February. This also occurred in 1984 and 1960, mainly due to cold Marches, and in 2017 and 2018 due to warm Februaries. The 21st was NJ’s warmest February day on record. Stations with records back well over 100 years set a new February standard, including Trenton (Mercer) at 78° and New Brunswick (Middlesex), where the 79° high exceeded the previous record of 77° established just last year on the 24th. The thermometer soared to 81° at Haworth (Bergen) and 80° at Newark (Essex), Oceanport (Monmouth), Wayne, and Jersey City (Hudson). Snowfall exceeded 4.0” in 16 of the state’s 21 counties, with the largest total at Montague (Sussex), with 12.6”. Evening rush hour gridlock for hours. The storm alone made this the 6th snowiest November statewide, with 4.1”. The 7.4” in the north was 3rd most on record and snowiest since 1938. Carrying over from December 26, 2017, long-running National Weather Service Cooperative stations came close to record durations of subfreezing temperatures. Sussex (Sussex County) had 15 consecutive subfreezing days, which tied for the 7th longest streak. New Brunswick (Middlesex) had a streak of 14 days, the third longest streak. The Atlantic City Airport in Pomona (Atlantic) had a 12-day streak, the 4th longest run. More notable for duration rather than extreme. Amidst the cold, a blizzard struck on the 3rd–4th. 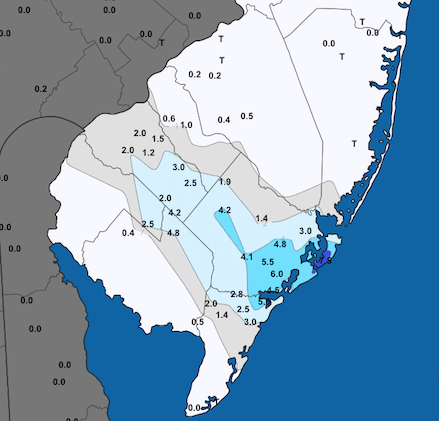 Snowfall exceeded 10” at locations in the four coastal counties, accumulating to 15.5” in Ocean City (Cape May), 16.0” in Margate City (Atlantic), 19.5” at Brick (Ocean), and 18.0” at Long Branch (Monmouth). Wind gusts reached 65 mph at High Point Monument (Sussex) and 59 mph at Cape May (Cape May). Persistent April chill delayed the green up of lawns and foliage, and the blossoming of spring flowers were delayed from normal by upwards of two weeks. Statewide, the April average temperature of 47.8° was 3.1° below normal, ranking as the 32nd coolest April since 1895 and the chilliest since 1982. Mild temperatures of September and early October significantly delayed the fall color season. Peak color was one to two weeks late, with most trees outside of the higher elevations still retaining the majority of their leaves at the end of October. The thermometer stayed below freezing during the daytime hours of Thanksgiving throughout the state. Wind chills were below zero. The morning of the 23rd saw lows of 3° at some northwest locations, with many locations in the single digits. The 9° minimum at New Brunswick (Middlesex) on the 23rd was the coldest for so early in the season (records back to 1912). Gusts of 50 mph or higher somewhere in NJ in nine months (not in Feb., Jun., or Sep.). 8 days with winds gusting above 60 mph at one or more NJWxNet or National Weather Service airport stations. Maximum 71 mph at Harvey Cedars on November 25th. Statewide, a number of especially windy days, including March 2nd, April 4th, May 15th, October 27th, and November 24th–25th. Finally, had the list been a top 11!